Jakarta, 18 May 2017 – The Human Rights Resource Centre (HRRC), led by Prof. David Cohen, Special Advisor to HRRC and Director of the WSD Handa Center for Human Rights and International Justice at Stanford University (Handa Center), met with the ASEAN Intergovernmental Commission on Human Rights (AICHR) on 18 May 2017 during the AICHR’s 24th Meeting at the ASEAN Secretariat in Jakarta. The AICHR, through its Chair H.E. Leo M. Herrera-Lim, welcomed HRRC to the meeting and conveyed heartfelt congratulations for the approval of HRRC’s Consultative Relationship with the AICHR. He also expressed appreciation for the work that the organisation has been doing through the years in support of the AICHR. Further, he reiterated the AICHR’s serious commitment to fulfil its mandate for protecting and promoting human rights in the region for a truly “people-centred” ASEAN. Prof. Cohen then presented before the AICHR a proposal for a study on “Understanding and Promoting Government-Led Good Practices on Human Trafficking Data Collection in ASEAN” that will be jointly conducted by HRRC and the Handa Center. 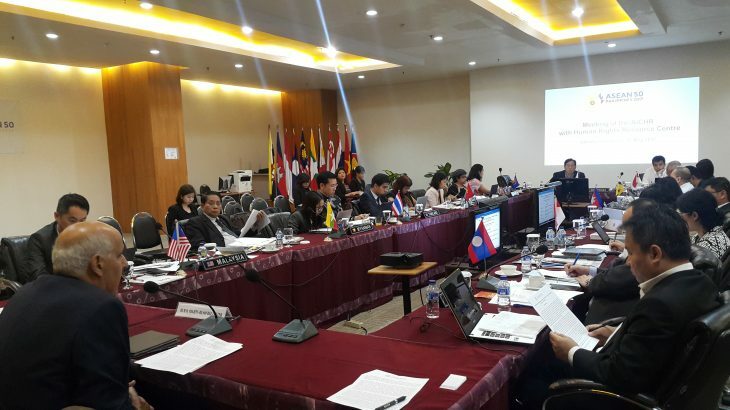 The proposed study aims to contribute to the development of initiatives to support the effective implementation of the ASEAN Convention Against Trafficking in Persons, Especially Women and Children (ACTIP) by identifying and assessing positive steps and good practices in four ASEAN countries (Cambodia, Indonesia, the Philippines, and Thailand), particularly in the area of data collection and analysis. The presentation was followed by an informative exchange between the AICHR representatives and Prof. Cohen that clarified the details of the project. This is the first meeting of HRRC with the AICHR since the grant of its consultative status in November 2016. The human trafficking data collection study is being proposed in line with the objectives embodied in the ACTIP, which has entered into force on 8 March 2017, and in support of the AICHR’s Five-Year Work Plan 2016-2020. ASEAN, News, Rule of Law, Vulnerable Groups ACTIP, AICHR. permalink.